The dirt road seemed interminably long. The jouncing and bouncing and general uncomfortableness of riding in a van with seven other people down a long dirt road really can’t be understated. Then we caught up to a truck that had been converted into a rudimentary bus that was slowly lumbering down the road ahead of us. Remember, we were on a dirt road which meant that now, in addition to the occasional jarring bump, we were being bathed in a fine dust that managed to find its way everywhere. Why were we subjecting ourselves to such torture? We wanted to see El Pájaro Toro, the Bull Bird, known to science as Cephalopterus penduliger and to birders who have studied the birds of Ecuador as a desperately wanted addition to one’s life list. Yes, the Long-wattled Umbrellabird, a Chocó endemic, was the object of our quest and the reason we were enduring a bone-rattling cruise to the tiny village of Recinto 23 de Junio. We had no hope of seeing a lek but hoped to at least catch a glimpse of a Long-wattled Umbrellabird. We were cautiously optimistic but knew better to count our umbrellabirds before they were ticked (or something like that). 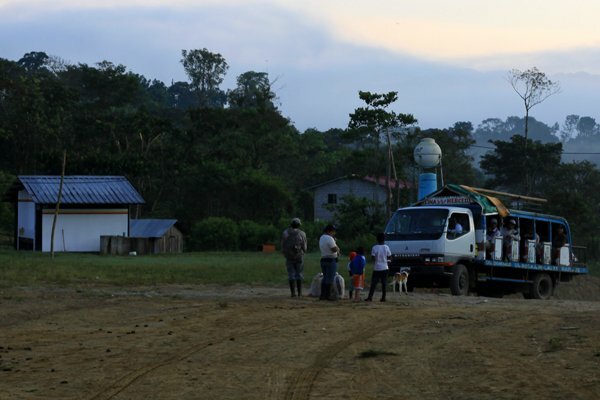 After passing the dust-raising truck we arrived at Recinto 23 de Junio, nicely situated next to a stream, drove through the village, parked on the far side and slowly got out of the van. We had no sooner been introduced to our local guide, Luis Ajila, then he was telling us to look, he had a perched umbrellabird! Sure enough, there was a distant but recognizable Pájaro Toro perched at the top of a tree. I grabbed my scope and got it on the bird and everyone had time for one look and then the bird took off and flew out of sight. Needless to say, we liked Luis a great deal! We piled back in the van and drove off, content with our sighting and happy to ride back up the bumpy dirt road we had just ridden down. No, of course we didn’t leave! 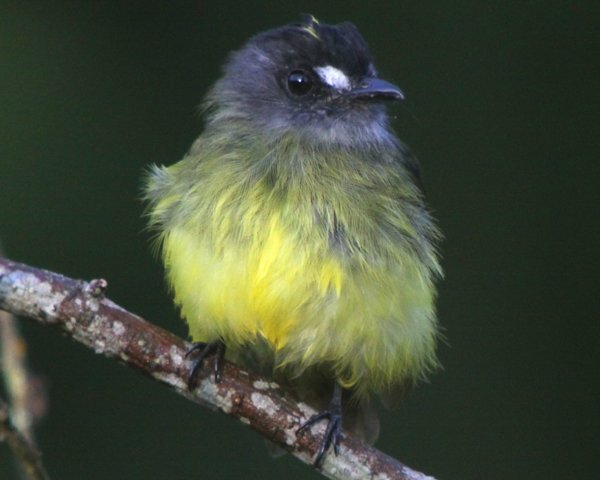 We wanted better looks, to say nothing of seeing other birds like the Swallow Tanager above as well. 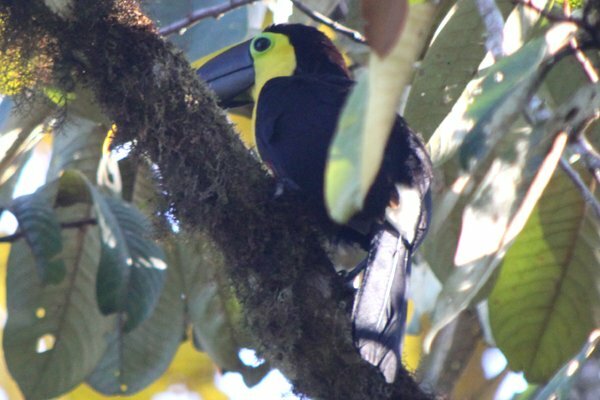 So, of course, we saw a host of birds, not least of which were the Chestnut-mandibled Toucan, Ornate Flycatcher, and Scaly-throated Foliage-gleaner below. We also had two more looks at fly-by umbrellabirds. Considering how disturbed the habitat we walked through was it was surprising how many birds were around the area. Some stands of forest persist, surrounded by cow pasture and agricultural plantings, and those remnants apparently offer enough habitat to support some good birds. 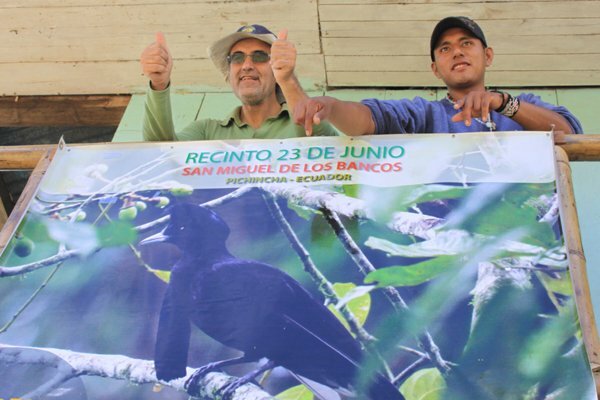 The hope is that as more birders visit Recinto 23 de Junio the more locals will realize that preserving what habitat is left and restoring some degraded habitat will pay for itself. To that end, when we were done with the morning’s birding we retired to Luis’s family’s front porch and ate delicious homemade cheese empanadas and drank great coffee. No one in the small village could miss our presence and Luis makes sure that they know we are there specifically to see El Pájaro Toro. Of course, in addition to enjoying the empanadas and coffee some of us also bought souvenirs to remember our visit. 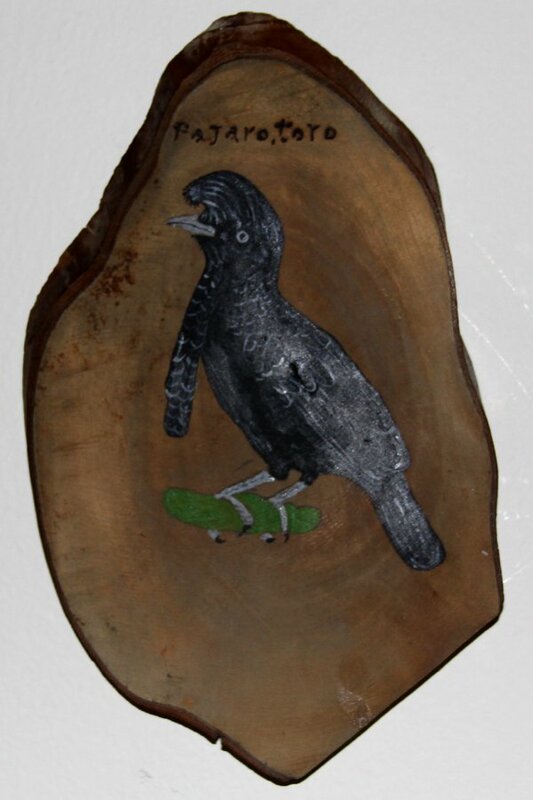 Mine, a nice hand-painted depiction of an umbrellabird on a piece of wood (a photo of which is up above), now hangs over my desk and every time I look at it I not only remember the bird but the delicious empanadas. Then I get hungry and go get a snack. But that is neither here nor there. 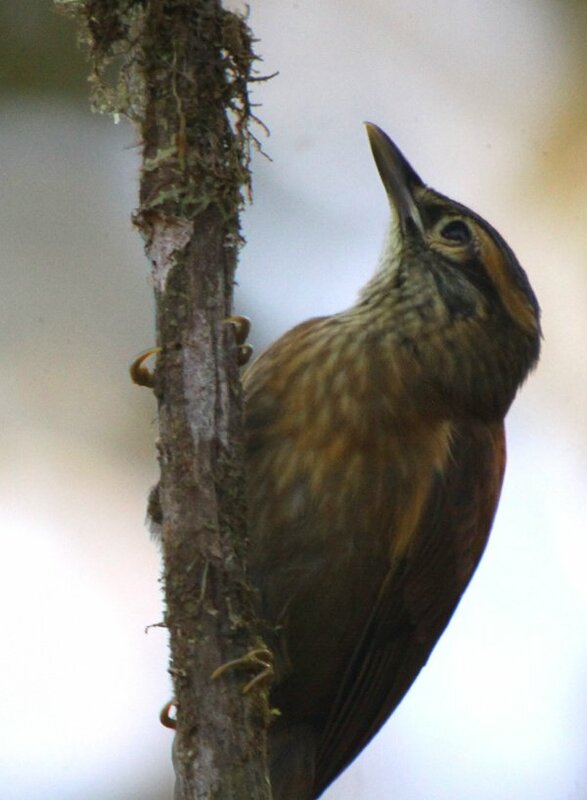 What matters is that in a small village in Ecuador there is a family that has a bit more economic security because one of them, Luis Ajila, has learned about a rare bird and is doing his best to conserve it and convince his neighbors to do the same. And that is worth a long ride down a dirt road any day of the week. 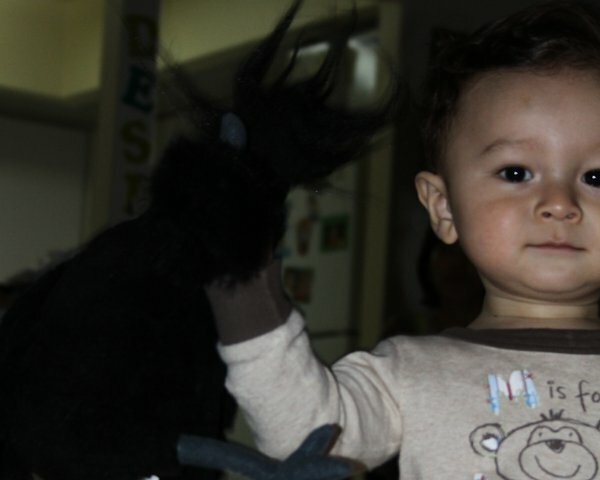 Desi loves his stuffed Long-wattled Umbrellabird but wants to see the real thing some day. Another great post Corey. Didn’t get to see that one as we were I believe no where near it’s range. Did manage to see the Ornate Flycatcher though. At Milpe it was one of the most common birds. Great photo of one above. @Tom: Thanks! I guess you guys got a bit more birds but we got some goodies. And, yeah, Ornate Flycatchers was one of the species that we saw often enough that I would feel comfortable on the ID if it showed up in New York (now that would be a find!). We actually accidentally disturbed the one above while it was taking a bath. Recinto 23 de junio is one of my favorite places to bird due to the conservation effect that birders have on the community. Of course seeing the Long-wattled Umbrellabird is a big plus for birders. I love Desi´s picture, I guess he is going to be a serious birder looking for serious birds. Yeah, nice images! 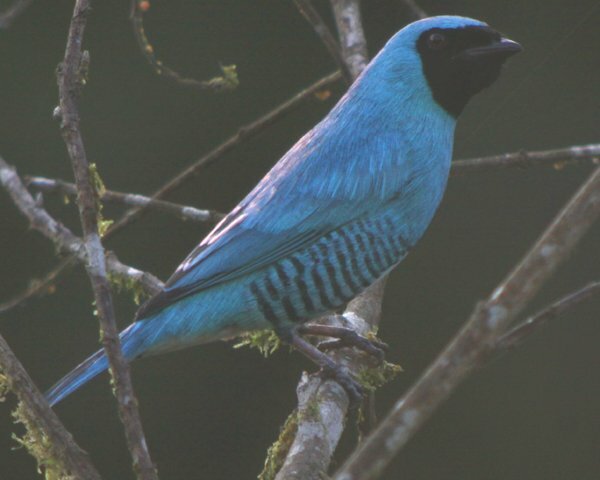 I especially love the Swallow Tanager because it looks like a miniature, pseudo-cotinga. I dont know how many times I thought I had a distant cotinga from canopy towers in Peru and Ecuador that turned out to be one of these guys when seen through the scope. I also want one of those plush umbrellabirds that Desi got!